Yesterday was a super windy bone chilling day. Just looking outside made me shiver. It’s quite embarrassing for me to admit that I didn’t even leave the house. I caught up with friends and family over the phone and email and fully took advantage of not feeling the pressure to “do something”. It was raining in LA (which we all know almost never happens) and I made the comment to my friend (hi Jen) how much I loved rainy days in LA. It’s like the universe is just giving you permission to stay inside curled up on the couch, watching sinful TV…shows that you would never admit to watching… while having a nice cupa tea. So I had my own LA rainy day in blustery Utah. I needed something yummy to go with my tea so I came up with these. Preheat oven to 350. In a small bowl add vinegar to coconut milk and let sit for a few minutes. Mix dry ingredients in a medium bowl. After vinegar and coconut mixture has had time to sit, add the cooking oil, cassia oil and agave nectar and stir together well. Combine wet mixture with dry ingredients and then fold in dried fruit. Add to muffin tin or silicone baking cups. I had enough for 11 muffins. Cook for 15 to 20 minutes. 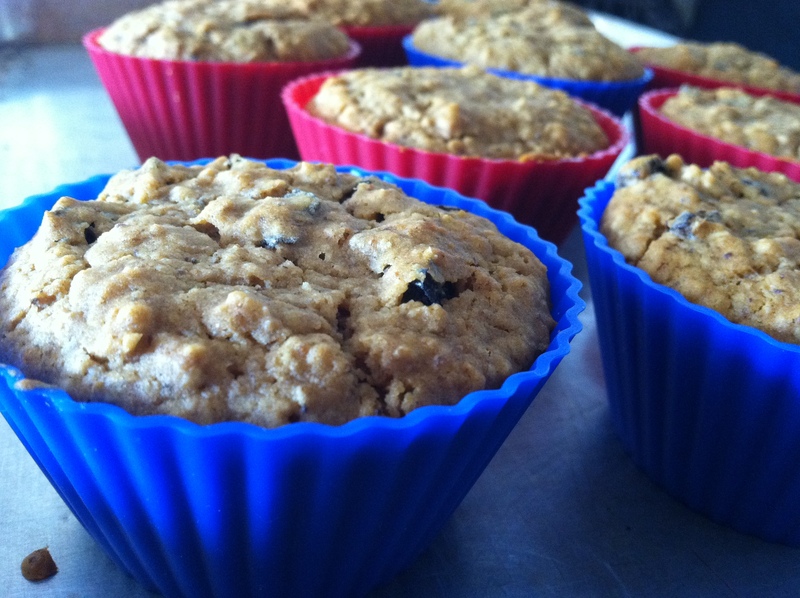 These aren’t overly sweet but they are delicious and moist….and Lennox approved! Enjoy!